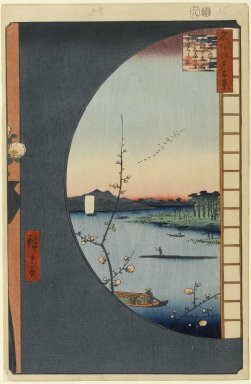 This scene in early spring looks out from the round window on the Sumida River from the second floor of a teahouse in front of the Massaki Inari Shrine. This restaurant may well be the "Kinoeneya," most famous for its "dengaku," small squares of skewered tofu, brushed with a sweet miso sauce and grilled over charcoal. The Uchigawa Inlet extends in the distance to the right. The area on the far side, below Mount Tsukuba, is the Sekiya no Sato, a name given for the countryside here. The popularity of Massaki Inari and that of the "dengaku" restaurants, within this area, began in 1757 and was still strong in Hiroshige's time.